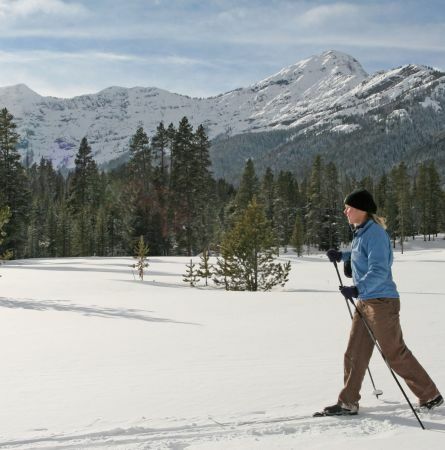 Yellowstone offers a variety of enjoyable and challenging trails for skiers. All trails are marked but may be untracked. The quality of your experience will depend upon the amount of planning and preparation you do prior to your trip. We suggest that you stop at a visitor center or ski shop and discuss your trip. The staff will be happy to provide current information on weather, trail, snow conditions, and alert you to any special winter hazards. • Do not snowshoe or walk directly on ski tracks. • Skiers/snowshoers going uphill yield to those going downhill. • Fill in depressions in the snow after falling to reduce hazards to others. Trails are rated by the National Park Service with trail ratings specific to Yellowstone National Park. We strongly encourage all skiers to inquire at a visitor center or Xanterra Ski Shops before beginning their first ski trip. Weather conditions may cause icy trails, deep snow, or barren sections, and in some instances make trails difficult to follow, increasing the difficulty of a trail. Trails are not groomed or checked daily. Skiers need basic knowledge and limited experience in the diagonal stride, snow plow, and side stepping. Trails may have short downhill and uphill stretches. Skiers need to be able to ski varied terrain requiring turning, snow plowing, herringboning, and diagonal stride. Skiers need to be experienced. Trails are hazardous and terrain is frequently extreme. Turns are often sharp and linked together with no room to snow plow or herringbone. Do not approach wildlife. Large mammals survive on stored fat and low quality food during winter. Causing them to move will cost them precious calories vital for survival. Park regulations require you to remain at least 75 feet (23 m) from bison and other large animals; 300 feet (91 m) from bears and wolves. You are travelling through essential winter habitat. Never approach animals, give them time to move away from you. Travel around a herd, not through it. Always allow animals an escape route through shallow snow or on a packed trail. Pets are not allowed on ski trails or in backcountry areas. Caution: Do not attempt to travel any backcountry trails without good topographical maps and first inquiring about trail conditions. Backcountry trails are marked on this map with dashed black lines. Many of them are difficult to find and follow as they are not well marked for winter travel and have not necessarily been skied recently. Many go through avalanche-prone areas that are not marked. Watch closely for orange trail tags marking the route because it may be difficult to find. Rolling terrain, some views, and possibly elk may be seen along this trail. Caution: Remove your skis for the short, steep section at the Lost Creek Bridge. Trails may have natural hazards such as animals, avalanches, thermal features, downed trees, steep slopes and cliffs. 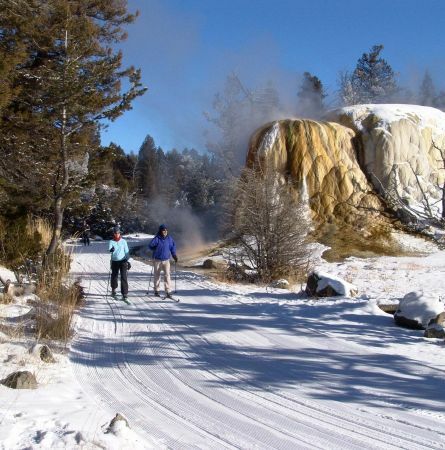 When skiing near thermal areas, stay on marked trails. Approaching thermal features is dangerous and prohibited. The snow in these areas is often icy and what appears to be bare ground may be a thin crust over boiling water. 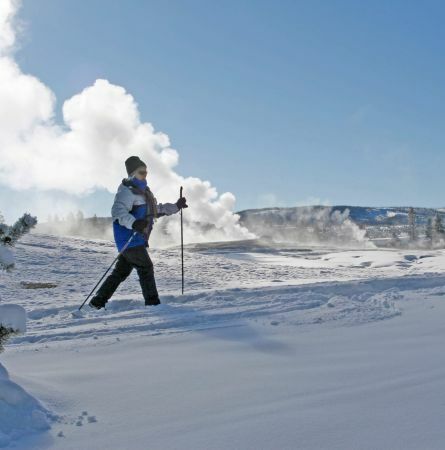 Winter weather in Yellowstone changes rapidly and can be severely cold and windy. Wear proper clothing layers. Watch yourself and other members of your party for signs of frostbite and hypothermia. For your safety, always ski with someone else. Tell someone where you are going, by what route, and when you plan to return. Carry extra clothing, food, water, map and compass, matches, flashlight, and a whistle. Consider elevation when deciding on a ski trail. 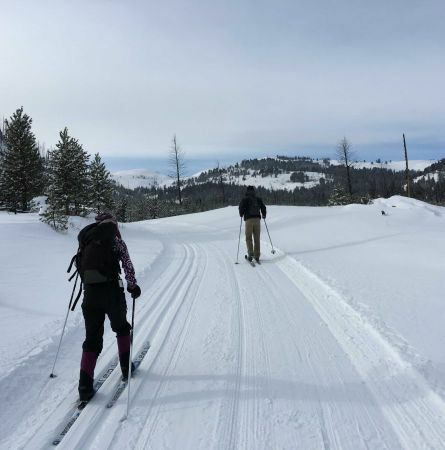 Many ski trails are at high elevation, above 6000 feet (1,829 m) and may require you to move slowly when you are out of breath. Always drink plenty of water. Avalanches can occur on any slope and hazards will not always be marked. In avalanche-prone areas carry a shovel, avalanche transceiver, probe, and first aid kit—and know how to use them. Cross slopes one at a time, while others watch from safety. For emergencies, dial 911.